The TNI guys posted a good roundup of all Hasbro's new products, prices, and release dates. Of particular note: Target exclusive Ultimate Battle Pack with MOBAT, HISS, Trouble Bubble, and 7 figures. For $50. Wow, that's quite the deal there, sign us up for one. Sure, it's a mix of things we mostly have... but the new stuff is pretty good. Read about it, and be happy. This week, you can snag the original (well, original Dreamcast port) of Namco's legendary Soul Calibur game. Lots of characters, great graphics, and good gameplay plus online play await you. No word yet on how the online play works, but for $10 it's probably worth your attention. Unless you plan to wait for Soul Calibur IV, as that has Yoda in it. There's also new downloadable questions for Wits & Wagers... but yeah. Fans of the WiiWare service can grab Magnetica Twist, which looks a lot like Zuma, we think. So we're not going to get it. For the Virtual Console: Neo Geo's Fatal Fury, where you can king and punch until you're blue in the face. Meaning no new classic Nintendo games, meaning sadness rules this land for yet another week. Ad: Desert and Arctic Forces are on the way! 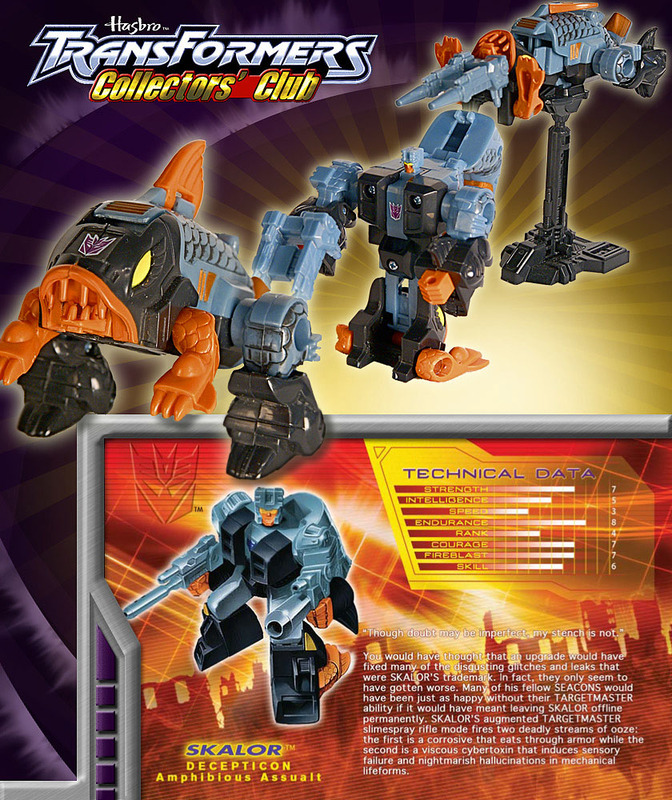 Entertainment Earth's Shared Exclusive Extreme Conditions G.I. Joe Action Figures are coming this Fall, and they're pretty slick. For $29.99 per 7-pack (or $57.99 for both), you can get a bundle of Cobra troops in brand new paint jobs. Vipers, Crimson Guardsmen, Snow Serpents, and more are all here as well as Scrap Iron and Major Bludd. If you like Cobra, now's a good time to get your order in for these. Sets are available by the case, by the pair, or individually at the lowest price on the web. Pre-order before they're gone! Transformers Round-Up: Unicron Returns to Transformers Universe? Fans of the giant planet eating robot, rejoice! Unicron is apparently coming back for a third repackaging, although some claim the toy showing up in the box on eBay isn't final. (We think it is.) Apparently a Toys "R" Us exclusive, this beast is probably going to appear some time this Fall. Want to know and see more? See the auction on eBay, or see the report on TFW2005. Also, TF08.net posted a big gallery of Arcee in vehicle mode, complete with a shot of the head. Which, if you didn't know, confirms she's just a white Decepticharge repaint. Still, kinda neat. The new Classics 2.0/Universe line of Transformers is, shockingly, hitting KB Toys. Each is $12.99, and includes Prowl, Sunstreaker, and Tankor. Happy hunting! Oh yeah, and the Transformers Happy Meals are out at McDonald's. Boy, it's a busy week! While working on the site and needing a break to delay carpal tunnel by another week, Adam dug into his LEGO buckets and cranked out pixelly replicas of Simon Belmont (as seen in Castlevania II: Dracula's Curse) and a Space Invader (as seen in Space Invaders). We're particularly pleased with Simon Belmont. We suggest you all go out and make one for your home or office. If you didn't already start reading our new comedy blog, Comedy Is Dead, you should. You'll find reviews (and maybe news) from an actual, honeet-to-goodness funny person and a member from the 16bit.com staff who pretended to be funny briefly from Fall of 2001 until late in 2002. How to Win!, a review of the Maria Bamford comedy album. By Shaun Clayton. Dana Carvey 2008 (or 2003, it's hard to tell), a review of Dana Carvey's Squatting Monkeys Tell No Lies HBO special. By Adam Pawlus. Take Offs and Put Ons, , a review of the late George Carlin's very first comedy album. By Shaun Clayton. We're once again enamored with the Danish plastic brick. After making some stuff over the weekend, and buying a few small sets lately, we couldn't help but feel a sense of awe and wonder at the 8637 Volcano Base, reviewed at Eurobricks. The bad news is that it isn't presently for sale in the USA in any capacity, but we hope to find out if it will be soon. He-Man 2008: Direct To Consumer? After the debacle that was the 2002 Masters of the Universe relaunch, it seems the line is going to come back in the fan-friendly (but not impulse buy-friendly) direct to consumer market. It's worked for a number of companies, and according to Q&A sessions at He-Man.org and Action Figure Insider, the new line will feature monthly releases from Mattel's new online collector store. Hm. So how much is that Skeletor going to cost us? Two new titles await you this week! One is yet another golf game, Golf: Tee It Up! from a developer we were not familiar with. 36 holes, wacky characters, blah blah blah. Did anyone get it and if so, was it good? The other new game, Schizoid, looks much more compelling. It's like an old shooter, except it isn't. Reviews call it a fun, co-op action game, or at least that's what Metacritic seems to be saying. Might be worth a shot. Each game is 800 points, or US$10. Fans of the WiiWare service can grab SPOGS Racing, which looks a lot like a wheel racing game. No cars, just wheels. We didn't download it either. For the Virtual Console: Neo Geo's King of the Monsters, where you can have monsters duke it out in a big city. Where all the promised 8- and 16-bit classics are, we don't know, as we're getting a little irate by Nintendo's lack of desire to take our money as of late. More exciting, though, is the Mega Man 9 footage making the rounds, because we're positively giddy to consider the possibilities of seeing a new, legit 8-bit game introduced in the year 2008. Oh, and we also got some build-a-droid figures you should check out. When you're done ogling those, feast your eyes on this Kmart Exclusive Mini-Cons Pack coming this Fall. The packaging is really gorgeous, and this is the first Kmart exclusive in recent memory (or perhaps ever) from Hasbro to feature a sticker advertising the product as such. We typically don't swoon over a box, but wow. Yeah, this one's purty. DVD site TVShowsOnDVD.com posted the box art for the upcoming Shout! Factory Mystery Science Theater 3000 - The 20th Anniversary Edition. That's the good, and only, news. Despite being box art, there's no indication as to which movie(s) will appear on the disc. Will it be new stuff? Will it be old stuff? Will it feature a set of decorative coasters? Hard to say-- but full details will be announced at, you guessed it, Comic-Con International in San Diego, CA. The Brothers Brick has some images and info on this newfangled Architecture set they're doing. Actually, it looks like two-- the Sears Tower and the John Hancock Center. No idea where you can buy these online just yet, but if executive toys are your thing, these should be perfect. Too good to touch a pencil? Then you'll love Coffeetime Crosswords, which charges you about $10 for 150 puzzles. About as compelling-- to us anyway-- is . Yeah, next please. Fans of the WiiWare service can grab Major League Eating, which actually lets you barf if you don't eat in a manner befitting a competitive eater. We may never play it, but we can't deny it's clever. For the Virtual Console: Neo Geo's Ninja Commando, which sounds like it may involve Snake Eyes of G.I. Joe fame. Although it doesn't, it does have vertically scrolling action. You can also grab the NES port of Donkey Kong 3. More exciting, though, is Gradius Rebirth, which better come out in the USA or we'll stab someone in the eye. Not kidding here. Stabby, stabby. They all look pretty decent, take a look! We missed this one. Also released for the Live Arcade service is the highly deceptive Double D Dodgeball. With a name that sounds like an imprint in Tecmo's Dead Or Alive brand, it turns out that there aren't any double ds anywhere to be seen. What it is, is a faux-retro game with lots of neon. In other words, some of the style has been aped from Pac-Man: Championship Edition, but none of the retrocity. Retroliciousness. Retroingo. You know what we're getting at. We got a $5 copy of Viva Pi�ata at Target on ye olde clearance rack, and that's been soaking up most of our game time. We suggest you also get one if it's $5. Since we're going to be out of town for a few days, we're going to try to see if this works out well. We're not sure how much actual reporting we can do, but we think we can update our Flickr account, so watch these pictures for exciting new things. So we hope you like whatever it is that ends up here as new things go live. We're not sure what it will be, ourselves. Oh, we also posted a review of Patton Oswalt's super hard-to-find CD EP Frankensteins and Gumdrops to Comedy Is Dead. It's rare, it's short, and we listened to it so you don't necessarily have to waste $75 on a copy. Over at the TFCC, you can now see Skalor! Photos and a file card were posted, so now you can see what you'll presumably be able to order shortly. It's not bad! In what may be a compelling upgrade, Capcom's 1942: Joint Strike is available for download like now-ish. It's also on the PlayStation 3. Early reviews are less than stellar, but it is a remake of the famous top-down shooter which everybody supposedly loves. The word "competent" seems to come up a lot, so our hopes aren't too high. For the Virtual Console: Sega Genesis' Super Fantasy Zone, a popular sequel to a sort of popular shooter. Also available is a neat looking shooter we've never seen called Gley Lancer. Which we want to play.